An icon reinvented: Shop the new Polo Ralph Lauren women's knit oxford. An icon reinvented: Shop the new Polo Ralph Lauren women's knit oxford. 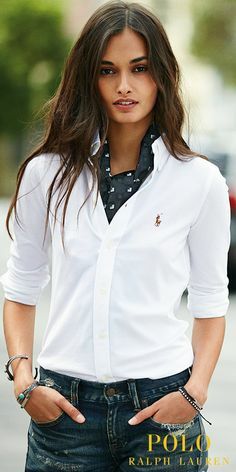 Inspired by two of our classics, this cotton pique shirt combines the tailored look of an oxford with the comfort and ease of a Polo shirt. A flattering trim fit, genuine mother-of-pearl buttons and our signature multicolored pony complete the versatile look.